OPINION — Over the years, I’ve made light of many of peta’s campaigns. It’s been a lot of fun, but my ridicule hasn’t made an appreciable difference in the organization’s approach to perceived animal wrongs. Or any difference, that I can tell. Which makes me wonder why people sometimes tell me I should leave peta alone, that they’re just trying to help animals as best they can. Well. For one thing, peta doesn’t care about animals, and never did. If peta cared about animals, it would not have euthanized thousands of dogs and cats over the years. That’s not the kind of thing you do if you really care about animals. It’s the kind of thing you do, in secret, as peta did it, if your goal is to control how people think, and animals are just the vehicle you have chosen through which to implement your dishonest people control. It’s like AlGore and his climate change hoax, except AlGore is less coherent, overall. For another thing, if peta really wanted to help animals, the organization could spend some of its mega donation bucks to actually benefit animals. According to peta financial records, about 25% of its revenue is spent on ‘research, investigations and rescue.’ That’s the only heading in peta’s financial statement that even resembles helping critters. I doubt peta’s numbers are honest, but there you go. To its credit, peta does attempt to promote humane treatment of animals, sometimes. For example, they’ve been trying to get the Florida Fish & Wildlife agency to require python hunters in the Everglades to kill pythons by shooting them in the head, and not just cutting their heads off. Snake heads, according to research, can survive oxygen deprivation for up to an hour after decapitation, causing undue snake trauma. For the record, Snake Trauma would be a lousy name for a rock band. For people who say they hate snakes, causing distress to pythons might be desirable, but if we’re consistent and honest, we have to agree with peta on this one. The group isn’t even trying to stop the python hunts, necessarily. They just want the snakes treated humanely. Snakes perform a vital role in our ecosystem, primarily the role of scaring the wadding out of people. They also eat rodents and bugs and other snakes, and python skins make pretty boots. So we need the snakes, although too many of them, as is the case with pythons in the Everglades, is generally a Bad Thing. Some people really like snakes, though, and I’d bet there’s someone, somewhere, who has a snake as an emotional support animal. 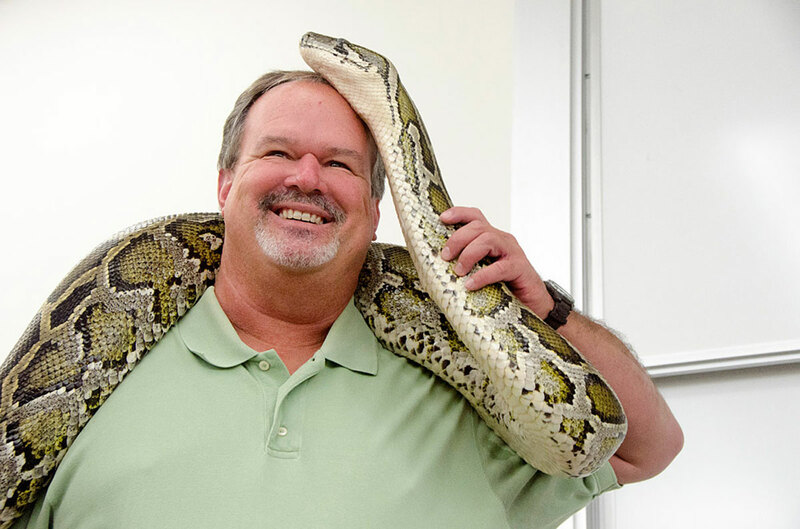 I would not, personally, want to ever be alone with that person, even in a crowd, but an emotional support python would have come in handy on a recent Frontier Airlines flight from Orlando to Cleveland. Emotional support snakes probably aren’t allowed on planes anymore, because of the Sam Jackson movie, but some airlines may be rethinking that policy now. According to the story in The Daily Wire, an unidentified woman managed to somehow smuggle her unidentified emotional support squirrel onto the plane, and was sitting in her seat by the time airline personnel were aware of it. The lady was told about Frontier’s policy of blatant discrimination against rodents and asked to take it outside, but she refused. So they called the Orlando police and had everyone get off the plane, and the flight was delayed for two hours. I think we can all agree that events played out in a horribly unfortunate manner in this incident. When I first saw the headline on Chad Prather’s website, I had high hopes. It said ‘Woman Brings “Emotional Support” Squirrel on Airplane. 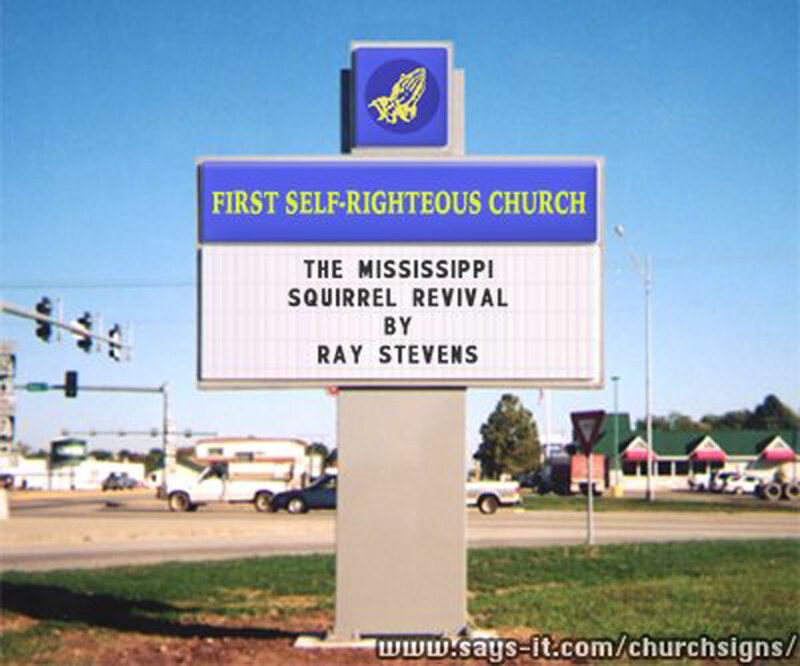 It Doesn’t Go Well.’ The first thing I thought of was the first thing you thought of: Mississippi Squirrel Revival, the 1984 hit by Ray Stephens, in which a kid smuggles a squirrel into services at the First Self-Righteous Church in Pascagoula, Mississippi, and it gets loose and causes all kinds of commotion. I was thinking the same thing must’ve happened on the Frontier flight. I was hoping for video showing the chaos, people screaming and running, the elusive, alien-like bulge in Harv Newlin’s coveralls. I envisioned baptisms, rededications, and mission commitments. I wanted to hear Bertha name names. A close second would’ve been if someone sitting behind the squirrel lady had an emotional support python. If the python had silently slid over the seat back and snatched the squirrel, the problem would’ve been solved, and no one would’ve had to get off the plane. This might’ve been a less-than-desirable scenario for the squirrel lady, and the squirrel, but you can’t please everyone. Besides, if your problems are so bad that a squirrel can calm you down, maybe flying is not for you. You don’t need a squirrel, you need a psychiatrist. Or three. And cut back on the caffeine, for goodness sake. And for the record, Python Heads would make a pretty good name for a rock band . . . I was here drinking some tap water and reading your piece and its some good stuff. I like the part about the dancers in the summer palace in St. Petersburg the most. Wish someone would figure out and write about what gives this water water its kick. Must be hard water. I am not an activist but from what I have witnessed they should ban all picket fences. The reason I say this is because my little dog likes to charge towards the squirrel in my back yard. I have witnessed this many times and covered my eyes and thought, oh no. I hope he doesn't catch him. So , the squirrel jumps on top of the picket fence, hopping along, and eventually finds the square 4 X 4 post where he can take a break and think it over. I sigh and pause. I look at the squirrel, I look at my little dog. The squirrel looks at me. The dog is oblivious to the wisdom. I feel embarrassed and blame myself about this all could have been avoided. as it turns out though, I guess I turned out to be the dumbest one of the bunch. they were just doing what they do. I understand the operation of the museum underwent significant turmoil some time ago. Have the issues surrounding the place been resolved? What organization is currently responsible for the operation and maintenance of a place I personally consider to be a meaningful contribution to San Angelo's history?